Subdued. That's how Thanksgiving was this year. After last year's big family gathering, our last with Grandma Shelby, we kept things quiet this year. Mama and Daddy came to the mountain for a quick trip. Sister Konnie and her husband, Jon Boy, hosted the crew, and friends drove in from the big city to join us in our low-key day of thanks. We had a beautiful view of the Cascades. Sister Konnie and Jon Boy cooked a feast. I baked that Pecan Pie again. And even Miss Kym who professes to dislike pecan pie, liked this one. 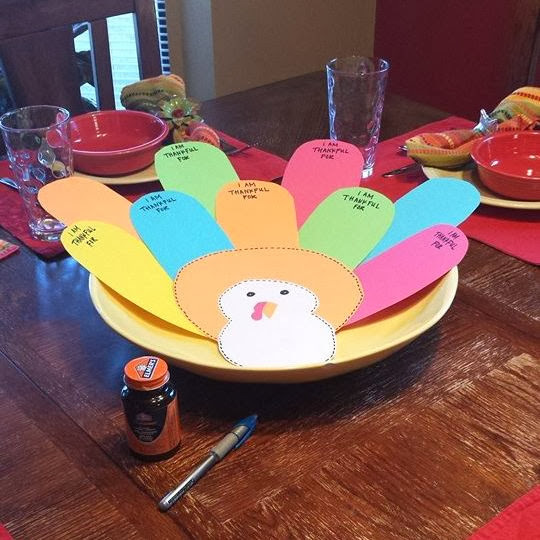 Crafty sister Konnie made a paper turkey for all of us to add our feathers of thanks. I thought about all the things I am thankful for: family, friends, health, work. But these are things I'm thankful for every year. This year, I was thankful for something new. And to build suspense, I'm going to make you come back here tomorrow to read all about it. I hope you all had a wonderful Thanksgiving. I really am full of suspense now!